As a child, I was continually exasperated by my brothers’ antics. 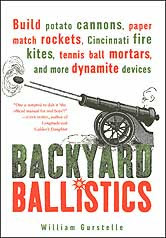 They were usually up to something – whether it involved wet toilet paper, waterbombs, combustibles and the like. So now that I have two sons, it’s dejavu all over again. Except, as parents, we are encouraging it! 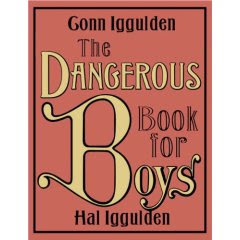 After reading a review on The Dangerous Book For Boys, and bumping into a friend who was biking with his son to their “secret hideout” to read the book together, we trotted off to the bookstore to look at it. The first sentence in the introduction had me hooked. So Marcus, who’s almost eight years old, has been reading this book. I balked at his request for “essential gear” like fishhooks and matches, but we’ve tried making a bow and arrow (couldn’t find a flint or bone for arrowheads, and I was squeamish about picking up feathers from our backyard), reading cloud formations, looking at bugs (although pill bugs don’t make good pets, and a toad peed in our house). We’ve read about the elite spartan warriors in the battle of Thermopylae, and the courage and tenacity of Robert Scott in his quest to reach the Antarctic. I was moved by the “Seven Poems Every Boy Should Know” section. I love watching Marcus just be a boy, and exploring the world that God made. I wonder how long it will be before we get this book? It’s summer! Time to make memories with the kids. A couple of weeks ago, we made a quick trip to the Georgia Aquarium in Atlanta. Named “the world’s largest and most engaging aquarium,” this place is slick, and the aquarium logo is absolutely brilliant. We ooohed and aahed as we drove into the city at 11:00pm, and I saw the biggest Borders bookstore, which looked like a castle with it’s own turret. After the best breakfast buffet I’ve had in an American hotel, we walked to the aquarium and were among the first of hundreds of visitors that day. The first tank we saw was the largest one, and we were awestruck. There were whale sharks swimming with other sharks, giant groupers, and an endless number of smaller fish – a symphony of natural movement, and very peaceful.